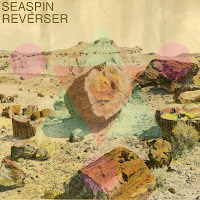 The pleasant waves of undulating distortion on Seaspin's Reverser EP remind me of quite a few post-shoegaze bands I loved in the early 2000s – Auto Interiors, Polara, or the Stratford 4 to name just a few. However, Jennifer Goodridge's cool and seductive vocals set it apart. The EP may not chart much new territory, favoring melodic over exploratory feedback, but my two favorite tracks, "Love Is A Fable" and "Give Yourself", both have a low hypnotic buzz that I find intoxicating. However, the riff in the chorus of "Reverser" (mp3) is probably the catchiest hook.